Chauncey Mitchell Depew was born in 1834 in Peekskill, New York and gained fame as an orator in 1860 while campaigning for Abraham Lincoln. 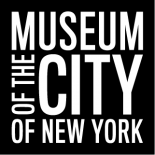 He later represented the interests of New York Central Railroad, first as an attorney, then as vice-president and finally as president of the company. He also served as United States Senator from 1898-1911. His oration skills made him one of the most popular after-dinner speakers from the late nineteenth century until his death in 1928. 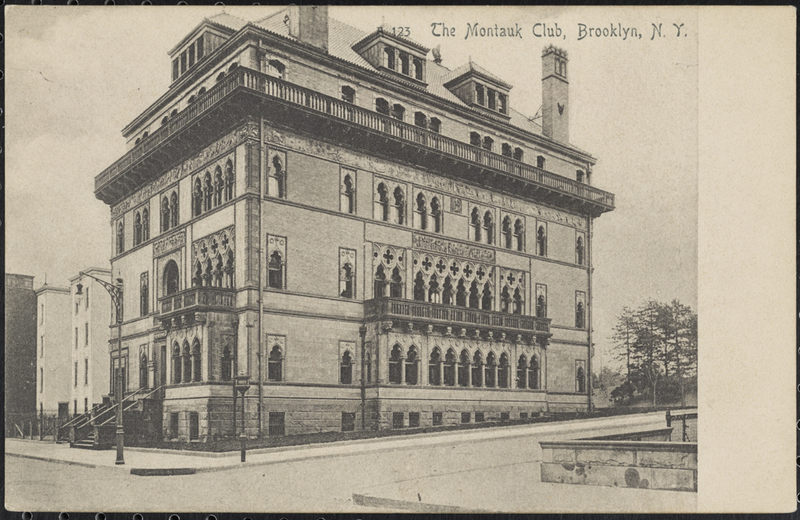 Every April, from 1892 to 1926, the Montauk Club of Brooklyn celebrated the birthday of Depew, shown below. To the same YOUNG DEPEW. But, Senator, you never show it. Just possible – it’s our old eyes. The age is there, e’en though it’s hid. But you can’t cheat time – the years are there. 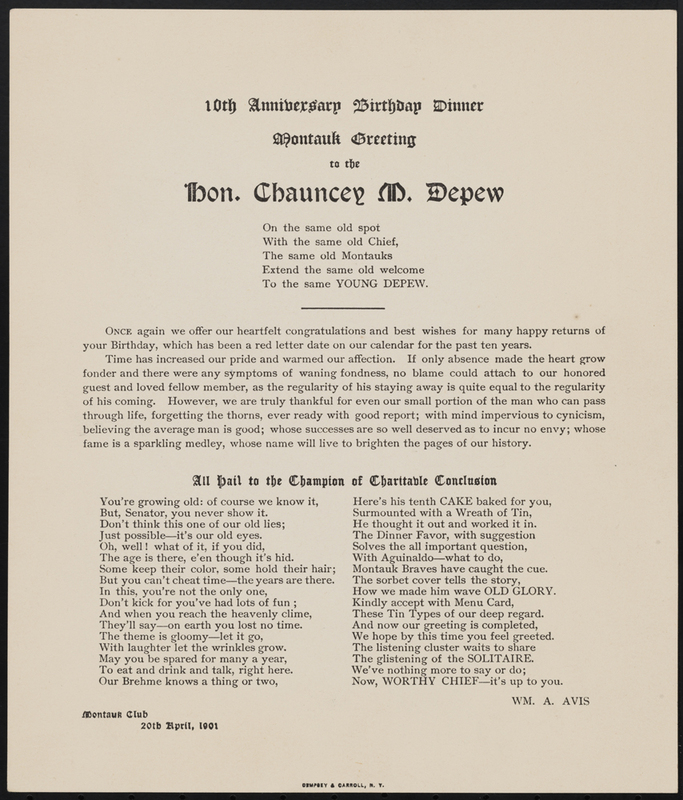 Depew has long since passed away, but the Montauk Club continues to commemorate Depew on its website. And in that set a noted chap, is young Algernon Brown. And all the ladies say he is the nicest boy on Earth! He goes to all the theatres, where he knows the coryphées. But when they chat, behind the scenes, poor Algy’s called a “jay”. The landlord kicked him out. And made him loop the loop. They meant to treat him right. On the seventeenth of March. 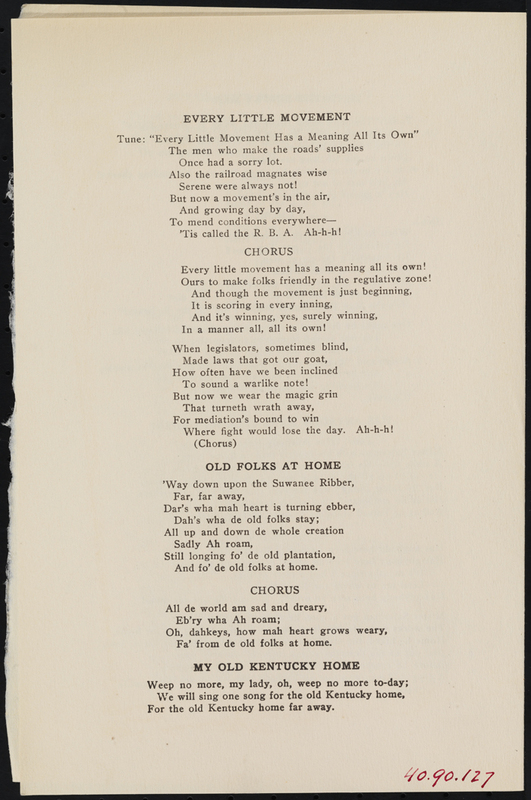 Paul West wrote lyrics for early twentieth century Broadway musicals, but he apparently moonlighted as a creator of corporate sing-alongs as well. The Railway Business Association published The R. B. 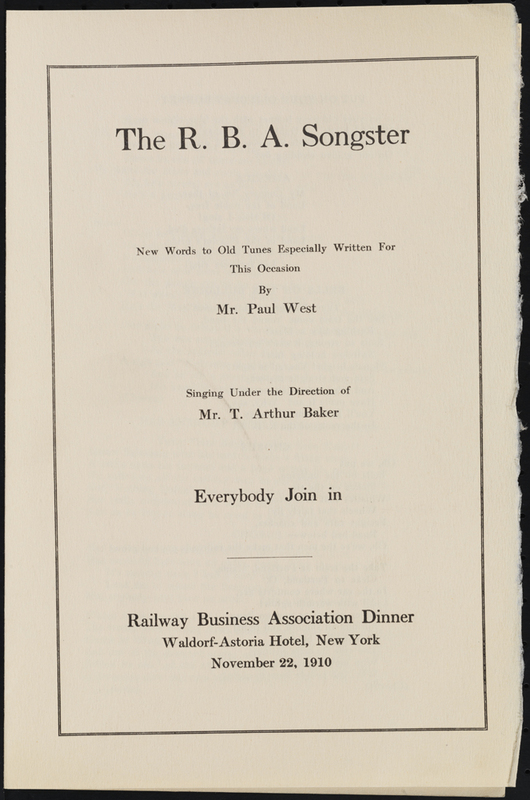 A. Songster for its annual dinner at the Waldorf-Astoria on November 22, 1910. Once had a sorry lot. ‘Tis called the R. B. A. Ah-h-h! Every little movement has a meaning all its own! Ours to make folks friendly in the regulative zone! In the late nineteenth century Republican politicians and party bosses met on Sundays in a corridor of the Fifth Avenue Hotel for discussion and debate. Participants would yell “Amen!” and soon the political gathering became known as the Amen Corner. 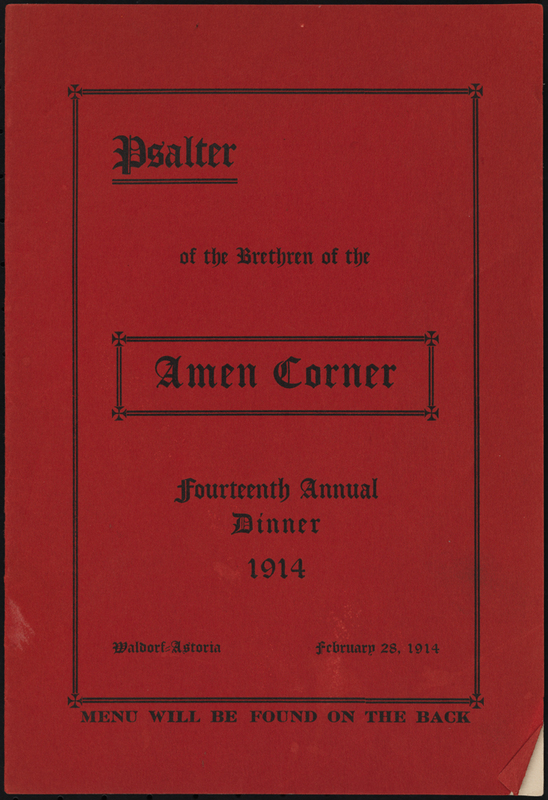 The Amen Corner outlasted the Fifth Avenue Hotel, and held its annual dinner at the Waldorf-Astoria on February 28, 1914. 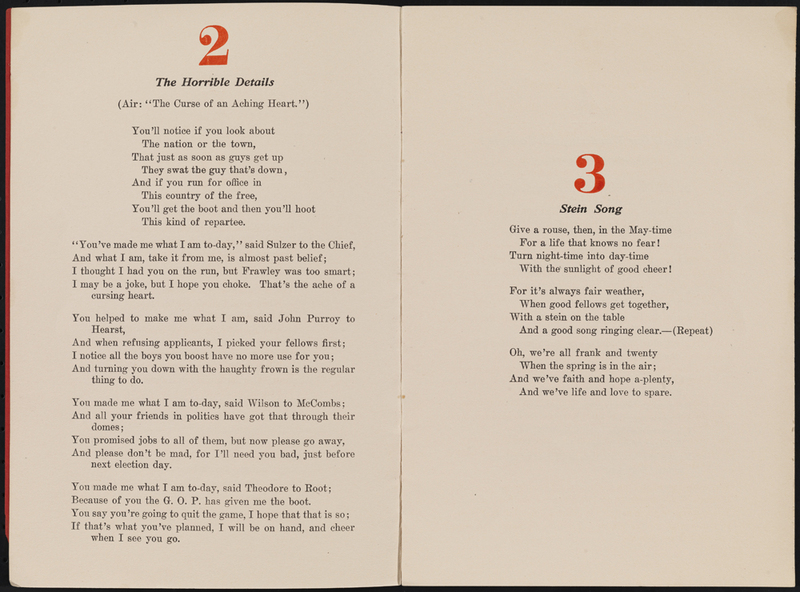 Do you know of other quaint company songs? If so, please let us know in the comments. The Montauk Club does indeed remember Mr. Depew with delight. He is a very interesting fellow. Thanks for the info on the song etc. 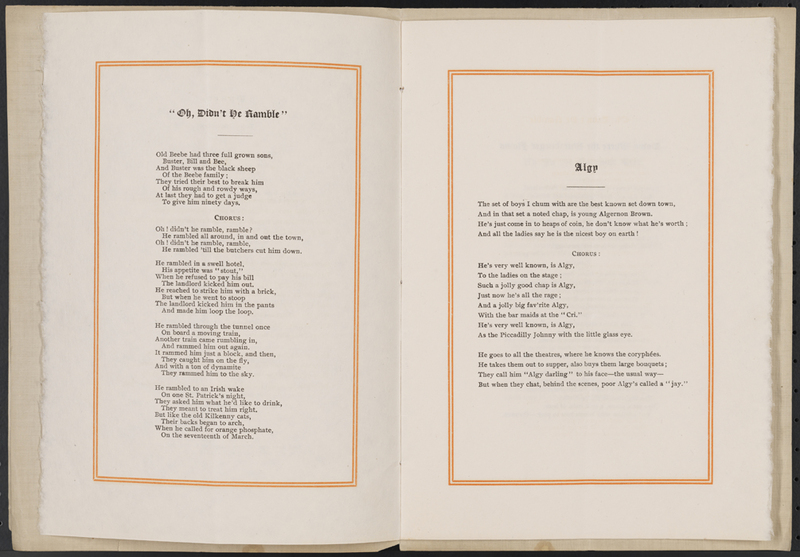 This entry was posted on June 2, 2015 by Lauren Robinson in Digital Project, Manuscripts and Ephemera, Photography Collection and tagged Amen Corner, Chauncey M. (Chauncey Mitchell) Depew (1834-1928), Dyker Meadow Golf Club, Ephemera, Montauk Club of Brooklyn, National Endowment for the Humanities, Railway Business Association.